Nub’s Nob Hasn’t Had a Halfpipe for Almost a Decade. Until Now. The new Nub’s Nob halfpipe is a Christmas miracle for skiers and snowboarders in Northern Michigan. Mid-December can be a golden time for local skiers. If the weather, equipment, a good crew and a dose of luck all align, most runs at Nub’s Nob can be open before Christmas. The crowds of that week haven’t shown up yet, but the snow is fresh and the hill is yours. One such December day took Sarah Mayhew up the Red Lift, where she noticed something unusual looming up as the chair began to climb: two massive piles of snow stacked high and running hundreds of feet long with a wide depression between them. Realistically it could only mean one thing. “We’re trying,” Doornbos revealed. Those were as many cards as he was willing to lay on the table at that point, but it was enough to make Sarah tear up a bit. It has been almost 10 years since there was a halfpipe under the Red Lift. At one time, Nub’s Nob was home to a halfpipe, a quarter pipe adjacent to it and a “super pipe” cut into the wooded hill to the northeast of the main park. It became like an industry unto itself to build and maintain these features, and in the case of the super pipe, only a handful of skiers and riders were even talented enough to use it. It was too tall, too fast and for most people, too much. From that high-water mark, things stepped back bit by bit over successive seasons. The whole undertaking had started to seem uncertain. Feeling like the hill had gone too far coincided with the fact that most kids who had grown up in the peak of pipe fever were getting older. In short, Nub’s Nob was questioning the halfpipe at a time when park skiing and snowboarding was moving into an interregnum of sorts: the park kids were growing up. They were growing into lives that were more complicated, less care-free with less time for the park, and the next generation was focused on slope-style. Building a park is considerably expensive, and it’s difficult to say in a good year if it is worth it from a business perspective. Add to that the rising trends of rails, boxes and smaller jumps in tandem with the popularization of street-style skateboarding, building massive park features didn’t look like a sure bet anymore. To sum it up, we let the halfpipe go. The Pipe Magician as we found it. The Pipe Magician—essentially a massive articulating chainsaw used to cut the curvature of a halfpipe—had long since been laid to rest in the grass beside the garage. The sun and weather took its toll for several years. Since no one expected the call would come to dust it off and hook it to the groomer, it decayed on a knoll by the pond. In its prime, that machine had cut every pipe feature of every size at Nub’s Nob since 2001. But now, not only was it old, but it was the only piece of primary equipment that Nub’s mechanics didn’t meticulously and preventively care for. If it were ever to be resurrected, the task would be hard-going and its success unknown. Then came the cold November of 2018. Sub-freezing temperatures came early and lingered. The guns came on in the early days of the month, and the cold scarcely let up for six weeks. Every day and night we made snow during that period, we had guns pointed at the Terrain Park. There is always a greater need for snow there for whatever park features ultimately get built, and what gets built is usually dictated by how much the guns can pile it on. 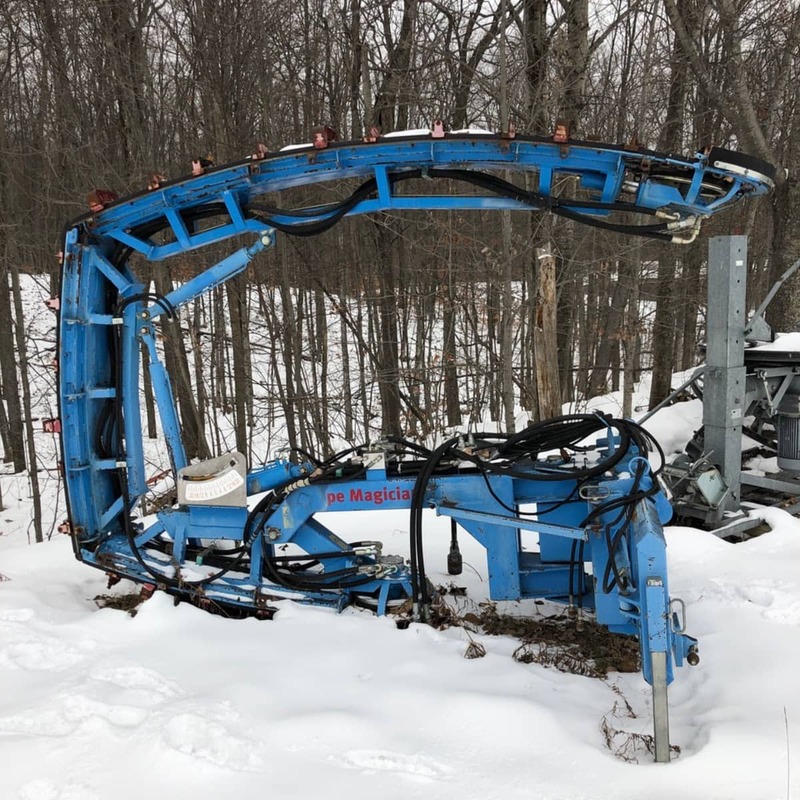 As snowmaking is often compared to the cycles and periods of great effort in farming (internally Nub’s Nob snowmakers are called Snow Farmers), no two years are the same. But to follow the farming analogy, 2018 was shaping up to be a bumper crop. Scott Guppy Koontz cutting with the Pipe Magician. Go for it they did. The Pipe Magician was still out of commission, and no one knew how bad, but snowmaking is a series of leaps of faith. Climbing towers is a leap of faith. Running snowmobiles in low visibility is a leap of faith, as is making decisions that affect every employee and every customer based on something as fickle as the weather. With that foundation, work began on the first halfpipe at Nub’s Nob in close to a decade without the one tool needed to finish it. Snow was shaped and piled to form the ramps and full-height length of the pipe, while a whole other effort took place to bring the Pipe Magician back from the other side. Johnny “Turbo” Viterbo and Chad Glazier, two of Nub’s Nob’s seasoned and experienced mechanics, moved the machine inside and took stock of what had to be done. In the end, all of the hydraulic lines had to be replaced, many new fittings had to be hunted down, the tiller flaps were far gone and had to be swapped out and the chains had to be thoroughly gone over. Nub’s Nob Area Manager Marty Moore, with help from our friends at Pisten Bully, hunted down parts in a search that literally crossed the globe. All of this was going on while the groomer was pushing and shaping snow in the park, and no one knew if any of it would be worthwhile. 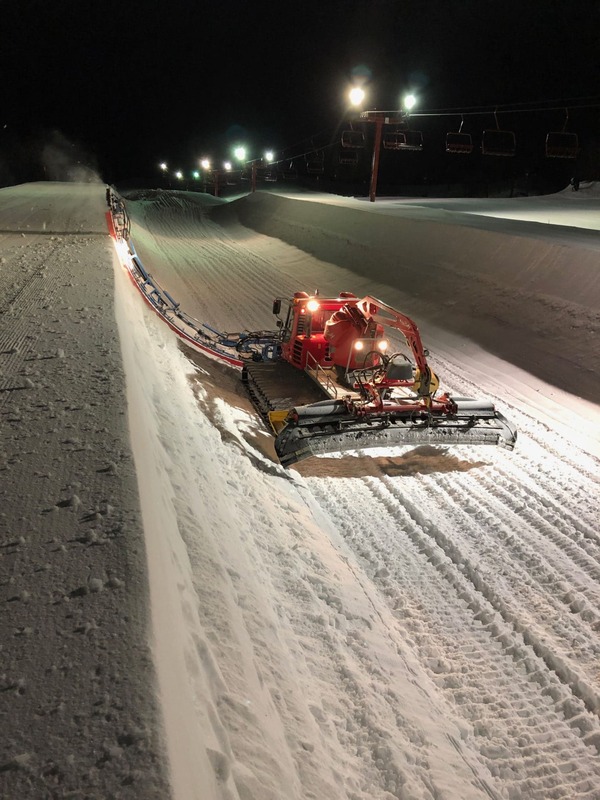 Even after a taxing stretch of making snow, there was enough faith and trust in the guys working on the different wings of the project, faith in the work we had put into the snow on the hill and the machines that sculpted it, to take a chance. The result is that Guppy was cutting a pipe 400 feet long and 12 feet tall with the Pipe Magician the Friday night before Christmas, and we are proud to unveil it as the cornerstone of the most aspiring park at Nub’s Nob in a generation. Riders from the seasons of yesteryear, full of pipe fever, remember what it was like to ride up the Red and see someone working down the halfpipe who was really good. The show from the chair was part of the experience because it often gave you a view of someone honing their skills beyond what you could do, and it drove you to take another run. That generation is still skiing and riding here. Now many of them have kids hitting the park on their own, and another wave of riders has grown up in the meantime with a style cut from their own time. The return of the halfpipe is our Christmas gift to all of them, and to those who just enjoy watching from the chair too. Our hope is that it will bring out a great synthesis of skiers and riders who cut their teeth in different chapters of the sport, and that this will foster mentorship, fellowship and good cheer. We are proud and thankful to work with the kinds of people who can pull off such a big project quickly and on the fly. We hope all of you who do the shredding take full advantage of it. 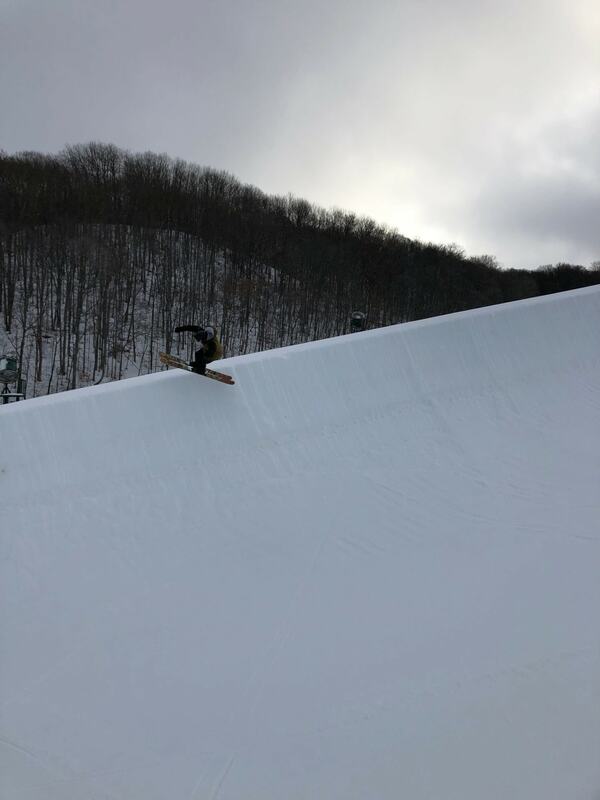 The morning before we opened the park, employee and friend of Nub’s Trevor Vandenbrink had the privilege of testing out the halfpipe while Ryan Moore was wrapping up the finishing touches on the rest of the park. The first time up the side he laughed with the thrill of it, and at the bottom, all he could say was “it’s good, it’s really good” before planting a hug on management. Take joy from what this group of people achieved, and may your Christmas share in some of the providence we enjoyed making it. Trevor Vandenbrink taking the honorary first run down the Christmas Pipe.